The resemblance below has to be coincidental doesn't it? 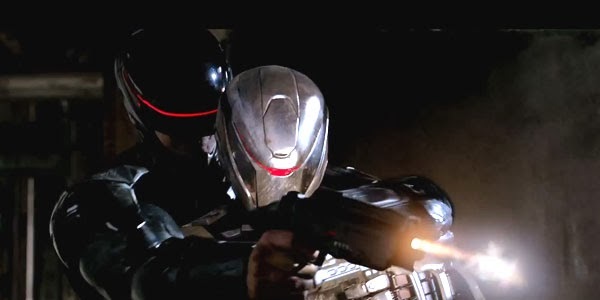 Will the 2014 RoboCop remake really put Avengers: Age of Ultron in a chokehold? The third trailer for the Gary Oldman meets Michael Keaton meets Samuel L. Jackson RoboCop, is one of the strongest yet, taking an emotive approach to the family man turned cyborg law enforcer. This is the first one that got me excited. It sure came from a different angle Random - and is it me or do the special effects look more 'finished' than previous trailers? I'll see it in theatres - will be good to see Keaton again in a sci-fi. They looked smoother. And I'm all for Keaton making any good movie. Science Fiction is just icing on the cake. No icing on the cake would be Beetlejuice 2. There's so much that could be done with that today.